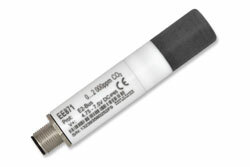 The digital EE871 probe from E+E Elektronik measures CO2 concentrations up to 50,000 ppm (5 % CO2). The compact probe is now available with a special filter cap which ensures high accuracy and long-term stability in H2O2 contaminated environment. This opens up new applications for the EE871, particularly in the pharmaceutical and biotech industries, where hydrogen peroxide is used for cleaning and sterilization purposes. The EE871 is a high accuracy CO2 probe for demanding applications. The IP65 enclosure and replaceable filter caps make it suitable for use in harsh environments. With the new filter cap, the measuring electronics are optimally protected against hydrogen peroxide. The measured values are optionally available on the Modbus RTU interface (up to 10,000 ppm) or the E2 interface (up to 50,000 ppm). The compact design, the electrical connection via M12 plug and the optional mounting flange facilitate quick installation and replacement of the EE871. With a radiation shield, the probe can be also installed outdoors. The CO2 probe is additionally available as a set with a conversion board and a connection cable up to 10 m long. The conversion board features an analog output (current/voltage) as well as a Modbus RTU interface and allows easy integration into the application. Configuration and adjustment of the probe can be performed comfortably with the optional adapter kit.